I took a few liberties when I made this pattern for the My Fancy quilt block. I decided it did not need so many seams so I added flying geese units rather than using two half square triangles to make a patch. I believe that if you don't need so many seams, why do so, when the look is the same. The interest in this block is building it. You start with individual patches, then combine a few patches to make a unit and then finally use those units to create the block. I also thought it was a fun block to make as it uses six different fabrics. 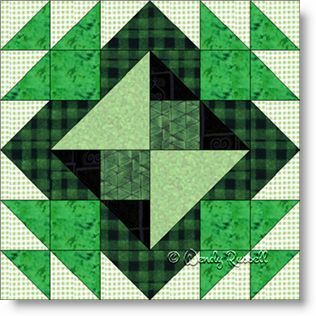 The sample quilts illustrated feature one setting of the blocks side by side, while the second setting is done on point with additional plain blocks to feature your quilting. Now it is your turn.